Gutter Knight Gutter Guards – Ipswich Gutter Guard supplies and installs a range of mesh to suit tiled roofs including terracotta, masonry, concrete, and metallic tiles like Decramastic. The mesh is installed right up under the base of the second tile and secured to the gutter edge by using galvanised screws. When installed the gutter guard mesh has a downward slope over the outside edge of your gutters. This makes it easier for debris and leaves to simply slide off or be blown off the roof. 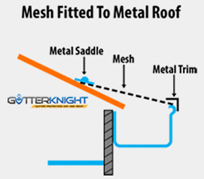 Gutter Knight Gutter Guards – Ipswich Gutter Guard supplies and installs a range of mesh to suit metal style roofs including Corrugated, bullnose (on verandas), Trimdek, and other types of metal roofing (if in doubt just give us a call). The mesh is secured to the roof using ‘saddles’ that are held in place with galvanised self sealing screws which places downward pressure on the gutter guard mesh keeping it secure and tight against the roof so leaves and debris can not get under gutter mesh. The other side of the gutter guard is secured to the gutter edge by galvanised screws forming an enclosed area that easily lets water in but keeps leaves and debris out as they just slide off or blow off with the wind. 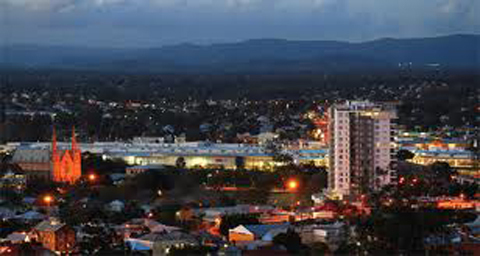 Gutter Knight Gutter Guards – Ipswich Gutter Guard takes safety very serious. If we deem a roof to be unsafe or dangerous we will not let our staff work on it. For commercial jobs we provide Safe Work Method Statements and perform Risk Assessments prior to starting these jobs. Our staff; carry roof harnesses with them and are trained in their use.